If you’d been waived and claimed three separate times in one season, what would you do? Sulk? Complain? Feel sorry for yourself? If you went with “find people making fun of you on Twitter and send them funny response,” you are Zach Boychuk. The video of what appears to be Ward casually tossing his malfunctioning ear piece over his shoulder and directly into the beer of a confused fan was great. The reveal that the flying object was actually Seguin’s smelling salts was somehow better. Wait, wait, wait. Everyone hold on a second. OK, I know this is the 10th grab bag and at this point, we’ve basically settled into a template, but can I take a quick timeout here? We have a situation. This was an unusually funny week in the NHL, and I feel like we need to call an audible and rework things. This is entirely unprecedented, but this week had so much hockey comedy that I think we need to double up. Who’s with me? Let’s play two! Recognizing the three additional moments or personalities from around the league that produced the most comedic fodder for fans this week. Let’s just say the NHL’s best Twitter follow may be getting a little antsy with the whole never-ending trade saga thing. I’ll set it up, he’ll knock it down. You’re all like “What? Mr. T? But he’s not a hockey player!” And then I’m all like “I pity you, fool!” And then you’re all like “Actually, demographically speaking, I might be too young to get that reference and may not even know who Mr. T is.” And then I’m all like “I feel old and sad and am going to drink all this scotch.” So anyway, this happened. The Senators owner has always been a little bit … [searches for polite term for “completely insane”] … eccentric, but this week he took it to the next level. Remember last month when Matt Cooke sliced Erik Karlsson’s Achilles on a play that everyone else in the world thought was accidental? Melnyk thinks it was intentional, and this week he revealed that he apparently has a team of forensic doctors on the case. Once this completely impartial investigation is complete, he plans to provide the results directly to Gary Bettman, who will no doubt thank him politely while desperately trying to avoid eye contact. Melnyk didn’t mention whether his team of CSI doctors were working in a secret underground laboratory at one of his islands shaped like a skull, but I think we all know that they are. Phew. OK, thanks. Sorry about throwing everything off, I just felt like it needed to be done this week. And we didn’t even get to the politician who got smeared as a Habs fan or Tuukka Rask’s wipeout or Bruins fans reacting to the Iginla swerve or Darryl Sutter’s face when Obama did the soccer ball bounce. It was a good week. Back to our regularly scheduled programming. 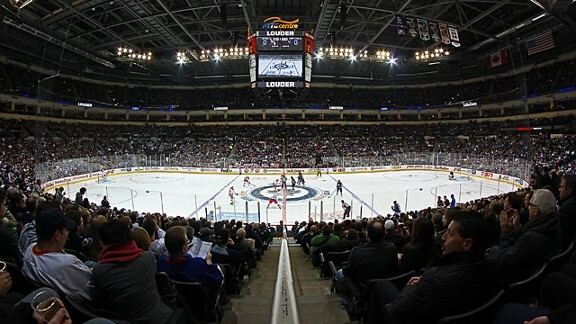 The issue: Some fans in places like Winnipeg and Edmonton are booing their own teams. The outrage: You can’t boo your own team! Fans are there to support the home team, not make things worse when things are going badly. Is it justified? No, and not just because of the clichéd “fans pay a lot of money, they can do what they want” line that players are trained to spout whenever this happens. It generally takes a lot for fans to boo an entire team (as opposed to an individual player, which often really doesn’t make any sense). It’s rarely because of one game or even one streak. If anything, Oilers fans have shown remarkable patience by not booing the team every night for the past few years. Although they might get lost on the details sometimes, fans are pretty good at picking up on larger patterns, and when they decide to turn en masse against the home side, it’s usually for a good reason. And a booing fan is always better than a silent one. Fans who boo still care. When the booing stops, that’s when you worry. With just a few days before the deadline and every hockey fan spending each waking hour talking about trades, this week’s obscure player really couldn’t be anybody else but Mike Sillinger. 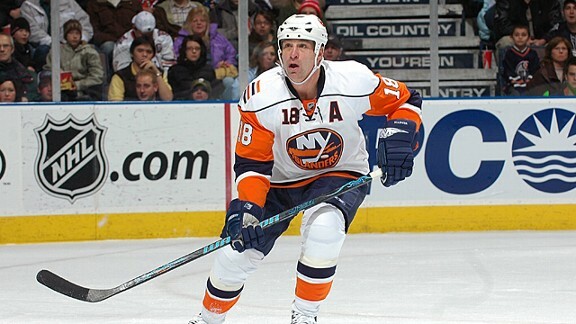 Sillinger was a first-round pick in 1990 who played 17 seasons as a reasonably skilled defensive forward. But his claim to fame is holding the all-time NHL record for most times being traded, at nine (or 10, depending on how you count the time he was traded twice in the same three-way deal). Sillinger switched teams midseason eight times, including six times around the trade deadline. I mean, look at that row of sweaters and numbers at the top of his Hockey-Reference page. That is a thing of beauty. I’ve owned computers in my lifetime that couldn’t display that many colors at one time. He ended up playing for a grand total of 12 teams. In one of my favorite pieces of random trivia, Sillinger’s list of employers includes seven different teams that didn’t even exist when he made his NHL debut. Side note: According to Hockey-References’s similarity scores, the third-most similar player to Mike Sillinger in NHL history is last week’s obscure player, Mush March. I don’t know what this means, but it feels important. This week’s debate: Should you create a fake media account on Twitter and use it to mess with people on trade deadline day? In Favor: Hey, that might actually be pretty funny. The Final Verdict: Seriously, do not even think about doing this. The rest of us are bringing our shovels. Being a GM is super-hard, you guys! Which you already knew, of course, because at this time of year we’re reminded of it constantly. We’re told that the salary cap has made it really hard to make trades, that there are too many teams still in the hunt, and that the days of even semi-interesting trade deadlines is long gone. 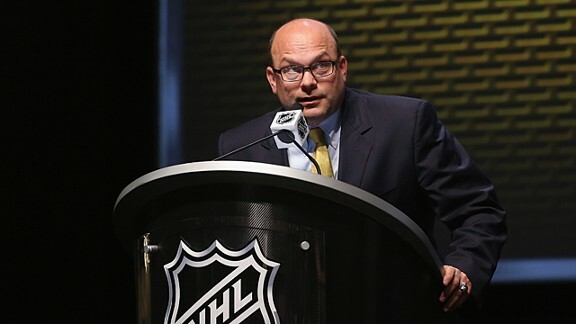 Any GM who gets near a microphone these days will immediately start bleating about how tough it is to do their job. Never mind that 29 out of 30 teams will be able to take on more than $5 million in cap hits by the deadline. Never mind that the league passed a new “salary trading” rule specifically to make it easier to make trades. Never mind that many of the teams pretending they’re still in the playoff race are not, in fact, anywhere near the playoff race. No trades for you! Look, NHL general managers, we are the hockey fans of the world and we’re only going to say this once: We demand trades. And we know what that means: bleary-eyed players stumbling onto midnight cross-continental flights; wives left behind to manage the remnants of a broken home; small children tearfully saying good-bye to school friends they will never see again. And as fans, trust me when I say we are all completely fine with this. So you having to put in a few hours of overtime this week isn’t going to faze us. We want our trade deadline frenzy. Stop with the whining and start making phone calls, transaction monkeys. This week’s depressing CapGeek page is the site’s “Rental Finder” feature, which I didn’t even know existed until just now. It’s a brilliant concept: a list of NHL players who are unrestricted free agents after this season and play for a team that is not occupying a playoff spot. So how could such a cool idea be considered depressing? Well, because … just look at that list. Yikes. In a league where rentals make up a big chunk of the deadline-day action, this year’s list isn’t exactly a murderers’ row of talent. It’s basically Mike Ribeiro and a bunch of guys who are going to get traded for a conditional fifth-round pick. Our only hope is that Dallas decides to move Derek Roy and Jaromir Jagr, but that probably won’t happen because I don’t think the Penguins need those guys. In related news, Mats Sundin does not believe that this page exists. This week, Don Cherry appeared to soften his stance on the use of visors. While he’d spoken out against them and mocked players who chose to wear visors in the past, he now feels that they’re acceptable as long as the players wearing them don’t … um … sorry, I got distracted for a second. Hey! You back off, Buzz Bissinger! That is Don Cherry’s schtick. There is only room in the sports world for one notorious old blowhard who wears outrageous clothing. You Americans already stole basketball and Phil Hartman, you will not have this! OK, that’s it, I am never making fun of Don Cherry’s wardrobe ever again. This week we travel back to March 5, 1988, for a game between the Canadiens and the Kings at the old L.A. Forum. The Habs are riding a seven-game win streak and are facing a struggling Kings squad, and it’s late in the first period when … well, this happens. • My god. This is terrible. This may be the single cruelest thing I’ve ever seen done to a fellow living creature. Just disgraceful. How can somebody be responsible for something like this and still be able to live with themselves? • But enough about the Kings uniforms, let’s talk about the chicken. • So yes, somebody threw a live chicken on the ice during an NHL game, which makes octopi and waffles seem sort of tame. Even stranger, for some reason the officials don’t see fit to blow the whistle for an extended period even though there is a live animal wandering around the playing surface. You’d think the rule book would cover that, no? • OK, I’m going to pause here so we can all get our “victim of fowl play” jokes out of our system. Everyone ready? Go. • No? Still not enough time? • So … we don’t want to talk about the stains on the ice, right? I didn’t think so. No good can come from that. When an animal starts making brownish-yellow stains all over the floor, there are only a few possibilities in play and none of them are good. Right, so we’re all agreed, let’s just pretend we don’t see them. NOBODY TALK ABOUT THE STAINS! • “Some type of a scarf or a flag?” Come on, Jim Fox, that is quite clearly a cape. A cape in the team colors, I might add. • The obvious question is how somebody managed to get a live chicken into a hockey game in the first place. Inside a sack, apparently. And, as the police officer quoted in the article helpfully explains, it’s not actually against the law to carry a chicken around in a bag at a sporting event. Do with this information what you will. • They put the chicken in a bucket. Oh, very subtle. I guess a deep fryer would have seemed cruel. • Finally, because I’m sure you want to know, here’s the official box score for this game. Stephane Richer and Bernie Nicholls each had four points, setting the record for most players to record four points in a game in which a chicken wearing a purple cape gets thrown on the ice, which most experts agree is unlikely to ever be broken. Oh, and if you’re wondering whether Don Cherry made a joke about how the chicken “looks like a new Swedish draft pick” … well, of course he did.